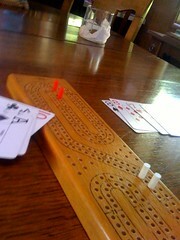 In the standard six-card cribbage game the winner is the first player to reach 121 points, and the end of the board. The cribbage rules do not require you to score exactly 121; any score that takes you past 120 points is enough to win - provided you get to count it! If the loser has not reached 91 points the victor scores a skunk, or double win. Some players also set a double skunk line at 61, for a three (or four) game victory, which adds a certain piquancy to a crushing defeat. The double skunk rules are optional, however. Now that you know the basic rules of Cribbage, you can start learning about Cribbage strategy and the secrets of the Cribbage masters!